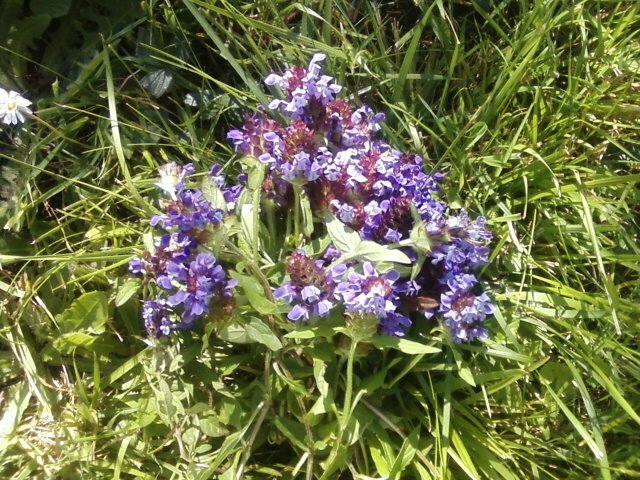 self heal will mostly be featuring in a healing oil i am planning to make, which will then become a salve for cuts and abrasions (we call them “owies” in the trades). 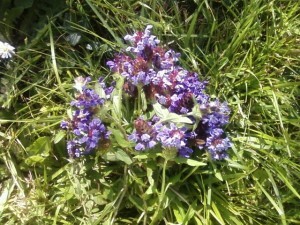 i’ll let you figure out what special herbal magic this plant does (hint: refer back to the common name!) it is also used in teas and infusions. 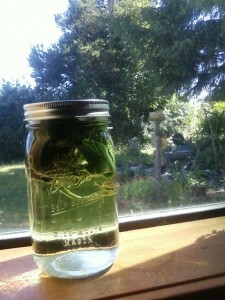 speaking of infusions, this is an infusion of my favorite plant at the moment, stinging nettle. it has been sort of a totem plant for me, lately. the more and more i read of its amazing qualities, each and every one of the things it helps with are things that… i need help with. i have been learning that i run low on the temperature scale, which may be a sign of lowered thyroid, a problem i never would have thought to look into. some of the minerals that nettle is rich in are said to be helpful in this area. in addition, i have been running borderline anemic on my iron levels, and nettle is fabulous both for iron and vitamin C, the necessary cofactor for iron uptake. i started this week being more consistent with preparing an infusion of nettle leaves for myself, and have been really enjoying it with a sprig of spearmint added, though the flavor of nettle is wonderful on its own as well. covering the “tea” while it steeps retains the goodies that would be lost through steam, and letting it steep for a couple hours allows more of the goodies to be released into the water. i can go on and on about nettle at the moment. the only thing i’m NOT going to tell you is where my secret little patch of it can be found in the wilderness!! !